To start making edits to your theme you’ll need to go on to your blog page and click Edit Theme at the top right. There’s a box called Menu Text in the options where you can change it from ‘Menu’ to any word of your choosing. We’ve kept the colour options for the theme minimal. 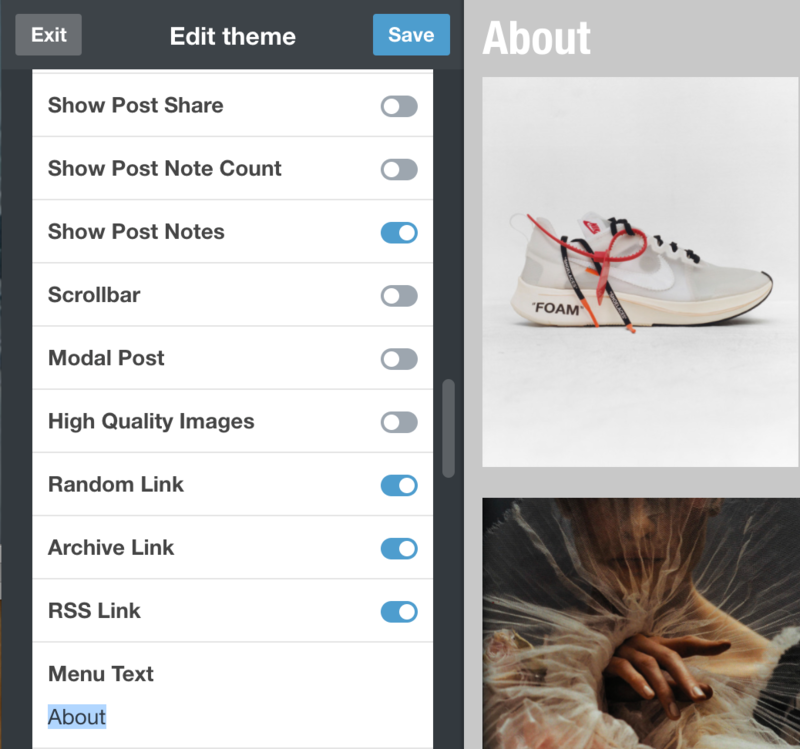 The few options let you take control of the look and feel of your blog. These can be located on the customization screen at the top. Background – This is the main website background. Post Background – This is the background for text posts/pages. I suggest setting this to a colour that compliments the background. For example the background colour is grey and by default the post background colour is white. Text/Link – This is for the websites text. It is important you set these to a colour that will stand out on top of the post background colour. No point setting the post background to black and the text to black because it can not be seen! Header Background/Text – This is for the websites header which appears on the left of the screen. These two options control all of it but you can also change the colour of the logo by changing the Logo option. Sidebar Background/Text – For the sidebar once it’s opened. Pretty straight forward. You can choose to use a text logo or upload your own logo. To upload your own logo find the Logo image box at the top of the customize screen and upload an image. The maximum height is 60px so all images will be resized to fit. You can change the font to be used as the logo (check the Fonts section). You can also customize the colour and whether you want the logo text to be all in capitals or not by finding the Logo Text dropdown menu. There are two options with adding fonts, Google fonts and Typekit. 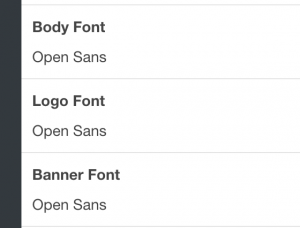 You can view a list of popular fonts to use under the Fonts dropdown in the customize screen. You can choose from these fonts or if you scroll down and find the boxes: Body Font, Logo Font and Title Font. In here you can set individual fonts for the body, logo and banner. In this example we will use Open Sans. Paste this into the Body Font box. This will change the font for the whole website. Excluding the Logo and banner. To use the font in the Logo/Banner you will also need to paste it in the respective boxes. Here’s the full tutorial on using Typekit with our themes. To change font size you will need to change the boxes: Font Size, Logo Size and Banner Text Size. 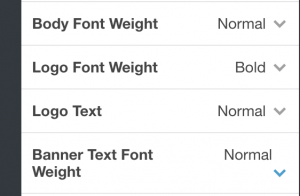 For font weights there are three dropdowns to adjust. The sidebar is on by default. You can also set it to open when users go on your website by turning the Show Sidebar on Startup option on (it’s off by default). To upload an avatar to the sidebar upload a Sidebar Avatar image. How to add a page to Tumblr. Tumblr’s Archive, Random and RSS links are turned off by default on our themes. Find the switches to turn them on. To add custom links find the Custom link boxes and put the name of the page and a link to the page. e.g. 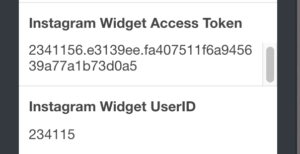 You will need to get your Access Token and User ID then paste it into the boxes. To link to your social media paste your profile link in the relevant URL box. You can add up to 4 image ads by finding the Sidebar Image Ad section, here’s an example of how you would add the four. You can choose whether to add a link/title to the images also. If you don’t want the sidebar then you can turn off the Sidebar option. It will still show up on Sidebar so if you want it removed there also turn on the Mobile Hide Sidebar option. The first thing you will need to do is turn on the banner because it’s switched off by default. If you only want the banner to show on the homepage you can toggle on the Banner only no posts option. After the banner’s switched on you need to upload an image. Find the Banner Background box and upload your banner image. Recommended size: 1400×800. For mobile you can also upload a Mobile Banner Background. Which will only show on mobile. 800px800px should be fine. If you are adding banner text/video I recommend also switching on Banner Overlay which adds a slight dark background on top of the image so that text stands out more. Once you have the Video ID paste it in to the Banner Youtube Video ID box. 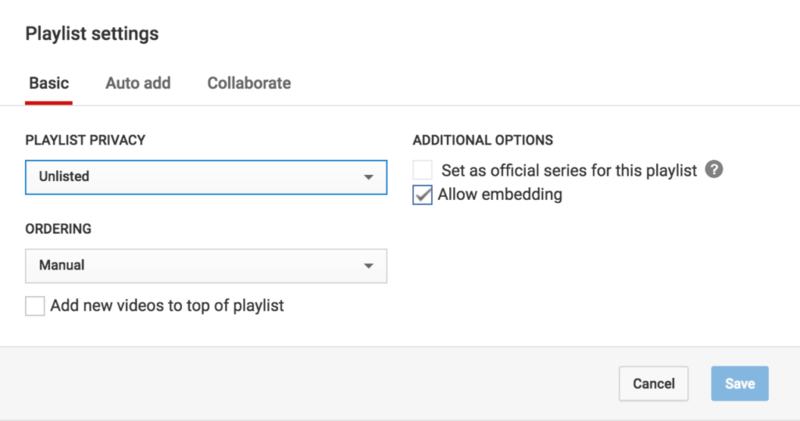 First make sure your Youtube Playlist is Public or Unlisted and that Embedding is allowed. Then, go to your playlist page and copy after list= make sure it looks like this. Then paste this in to the Youtube Playlist ID box. Also make sure you have nothing in the Youtube Video ID and Vimeo boxes. Make sure embedding is enabled on the video then copy the video ID from the URL. 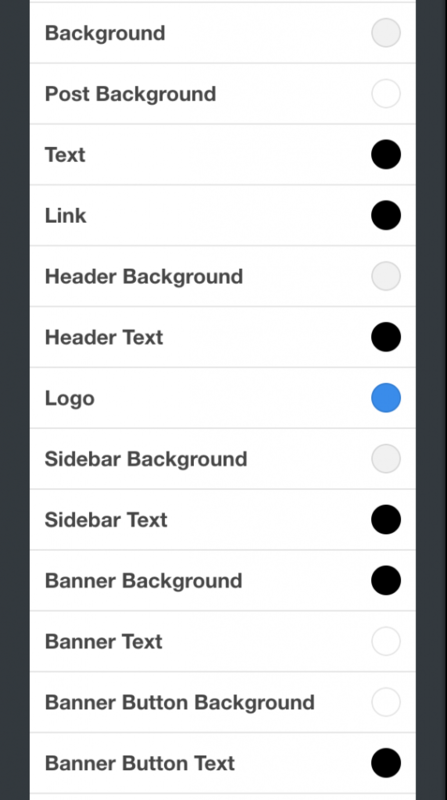 If you do not want the banner to show on mobile toggle the Mobile Hide Banner option on. You can also remove the video buttons by switching off the option Banner Video Buttons. Next you can add some text or a button. Just find the Banner Text box and the Banner Button boxes. On mobile you can hide the banner by switching on the Mobile Hide Banner option. You can also add a Mobile Banner Background which is an image that will show on mobile instead of the main banner image. You can customize how posts look by changing the Show settings. It’s self explanatory. 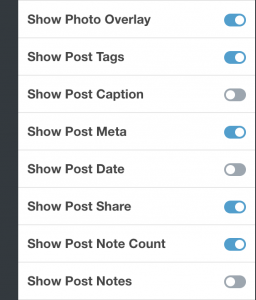 By default posts open up in a modal window. To turn this off turn off the Modal Post option. By default photo posts have no caption but once opened the caption shows. You can customize how many columns of posts you want. To do this find the Posts Columns dropdown and change the number, it’s that simple. To display posts double the size add the tag x2. By default the scrollbar is off to create a more even layout. You can put it back by enabling the Scrollbar option. These are the icons that appear on the bottom left of the header. In order they are, load more posts, scroll left/right and hide/show banner. You can turn them off by turning off the Site Options Icons option. On Google Analytics create a new property for your Tumblr blog address and paste that tracking ID in to the Google Analytics ID field in your blog’s Customization settings. 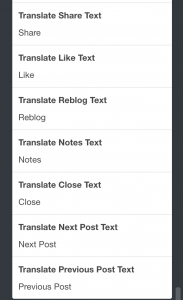 If your website is in a language other than English you will need to find the Translate section in the Customize screen and translate the text that you see there. To remove Stash credit from your website you will need a Full License. Instructions are provided once you’ve obtained the license.